After the excitement of the last turkey hunt we had planned to return to the south and hit up some crown land. I even brought Al again, he did transport my prize feather through the battlefield of the thorns, so he’s earned it. We returned to work and as usual, the 9-5 (ish) consumed us and by Thursday morning we still had no plan. Al was consulting with several people on crown land sites and called Steve Thursday evening. Steve let Al know right away that the crown down south is heavily pressured so we should just go to their place again and he’d set us up. As I said in our last post, the Shores are amazing people – they truly live by the “my house is your house” philosophy. Al called me right away from night shift to let me know we’d leave (or start to) as soon as he was home the next morning... after we packed, dealt with some house issues and ran out to our bear bait we headed out. Around 2pm we left the city, I drove while Al caught up on some Z’s. With my partner in crime asleep in the passenger seat, I spent our Friday drive with thoughts of turkeys and tactics. I went over in my head each turkey from the last weekend and how I might have approached each one differently. Move a little slower, use my bipod, sit up a little higher and most of all remain confident. This would be our turkey weekend. I suppose I was truly feeling the “we” on this as I forced Al to be the first up. If we were to have meat in our freezer the best chance would be if Al shot. After all he had the 12 gauge with Turkey shot, his spray remained tight at a distance twice that of mine. Plus, if I’m being honest, he was the calmer and more seasoned hunter. I was still a little lacking in the internal cheerleader department. When we arrive Friday night, Steve showed us exactly where to set up and how to find it in the dark. Saturday morning was to be our first solo mission. Al was our caller and shooter; I took up my spot behind the camera. I’ll never knock the advantage of being behind the camera – all the thrill with no pressure. Your heart still pounds in anticipation, you still get nervous that maybe you’re moving too much and you still get that rush when an animal comes in. It was exactly this way when Al’s birds came in. 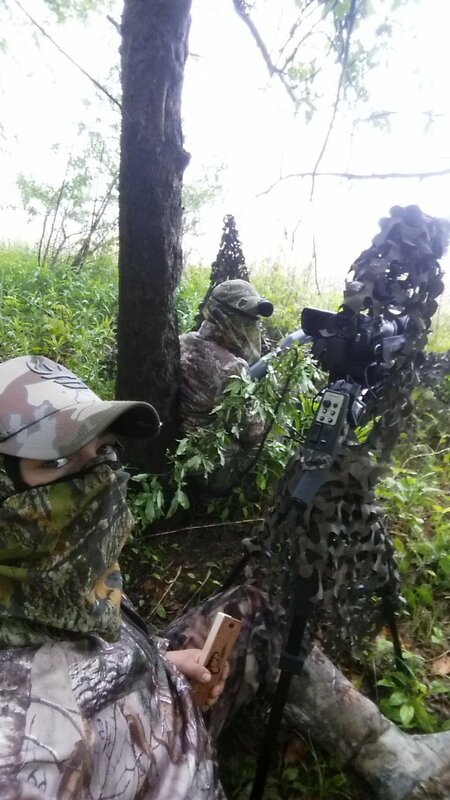 We have the advantage of essentially a Shore Outfitting experience and that Saturday morning was no different, a prime spot where the gobbles started as soon as the day did. As the sun started to peak out from beyond the endless corn fields, the forest came alive with the sound of turkeys. We heard 2 toms behind us in the ravine and another tom off in the distance somewhere in front of us. Al would cluck and yelp and all 3 would respond with an intense session of gobbles, a competition for our love. Another yelp and the gobbles from behind became quieter! They had left their tree and the next gobbles had Al and I exchanging wide-eyed glances, they were headed our way with determination. We turned on the camera to capture the sound as it grew louder and louder. I was mesmerized, it was still too dark to see in the forest and we already had toms headed our way. We had set up with our backs to the forest, just behind the fence line with the field in front of us fence in front of us. We kept the break in the fence to our left (Turkeys are lazy AF and will almost always walk the fence line until they find a break) and we put Al closest to them so we could capture the birds easily on film without getting in the way of a prime shot. Al had prime seating (again, I’ll point out that I’m 5’6” and Al is 6’2” so I can’t see jack over him) and watched as our fine feather friends move through the forest no more than 30ft behind us and to our left. Neither of us moved as the toms moved with a purpose in plain view of us. I was terrified our camera screen would give us away so I never flipped on the screen (Steve was busted our first day in a similar situation) but the turkeys stop only to throw their heads down and gobble with all their might. Sure enough those boys went straight for the hole in the fence and into our field. The first light was beginning to touch the field when I spotted them, 2 big toms strutting in calm and cool in the morning breeze with their attempts to woo our decoy. I slowly reached up to turn on the camera screen and realized in the dark the cameras camo had fallen across the viewing screen; I adjusted the camera as best as I could and gave Al the word the birds were on screen. He brought his gun into position slowly as we watched the boys fan and gobble, they drew closer but were hesitant and I heard the muted click of the safety coming off. The birds had become nervous of our decoy dancing in the breeze, what at first had seemed to them as some sort of alluring turkey Kizomba had become an awkward running man. Al yelped and the oldest tom puffed up and decided maybe he enjoyed the running man after all, but when our hen wiggled again he changed his mind (clearly not one for awkward girls). Al made his decision and shot through the undergrowth, losing half his pellets but sending the bird running more into firing range. An immediate reload and the second shot exploded the morning’s chaos and sent the tom to the dirt. Al and I fist-bumped (as customary for all great moments such as ‘animal down’ or ‘remembered to grab the multi-tool from the truck’) and we set up to tag the turkey. Some more chaos followed but we had our first bird! Al had downed a nice big tom with a beautiful fan, a long beard, and at 20+ lbs, a lot of turkey meat for our freezer. We took our prize to the truck and set back to the Shore residence to take a nap in the sun lit, living room (with a huge moose mount Al cannot stop talking about) all before 8am. We spent the rest of the morning and into the early afternoon lending a hand here and there so we didn’t feel like complete free loaders. The Shore’s don’t joke around when they say “mi casa su casa” and they fed and sheltered us without questions for 2 weekends in a row – as I said last time, they have to be some of the nicest, most down-to-earth people we’ve ever met. In the mid-afternoon we took off to hunt in the thorn bush again, we knew at least two more birds were in the area (Al downed his in the field adjacent to the thorns) and likely a few more based on the close encounter Steve and I had the weekend before. We spent the next few hours walking and calling but hearing nothing in response. At around 5pm we sat up in the forest behind where we heard birds that morning. We had high hopes of catching the now 2 birds on the circle back to their roosting areas. We called and called but no one was interested in us, we got stood up! Just as we were about to pack it in I caught a flash of blue at the forest edge, something moving and fast in the field. I knew the colour didn’t belong to the foliage so I stared at it, watching it move in an odd, gliding sort of way. I tracked it and it disappeared into the dense bush. Now I know we’d been staring into the bush for hours on end but the gliding blue form was real, even if it didn’t make sense. Definitely wasn’t a turkey and that I checked deer had white tails, not blue. No flower or bird were that large or moved like that. My brain whirred through the possibilities and came to a conclusion... it’s a man on a bike in a blue coat. A man in a blue coat, on a peddle bike, in an old corn field?! I shared my thoughts with Al and attempted to point the man out when he reappeared in the next opening. I saw him again but Al didn’t, a man on a bike in a field didn’t make sense, and my eyes were prone to playing tricks on me. We were almost out of time so we packed up and left, discussing the man as we went. Al agreed that maybe there had been a man but no way he was on a bike and by the time we reached the truck the whole thing seemed more distorted then it started out. We filmed some B-roll and as we were tossed the gear in the box I looked down the road. Sure enough, there was a man in a blue coat on a bicycle heading out of the far end of the corn field! Who goes on a leisurely evening ride in a corn field?! That night I dreamt of cyclists ruining our hunt, waking every hour to check the time and the weather. A storm was set to hit us early morning but the storm radar seems to change constantly. By 4am Sunday morning we were awake and excited for the morning hunt. Our excitement quickly came to a halt when a huge crack of thunder shook the barn. We put our boots on and ran to the door, sure enough it was pouring and that storm has no plans of leaving. Precipitation in any capacity we will tolerate but stalking through an open field carrying a metal rod didn’t seem like such a good idea. We went back to bed and listened to the storm rage on. 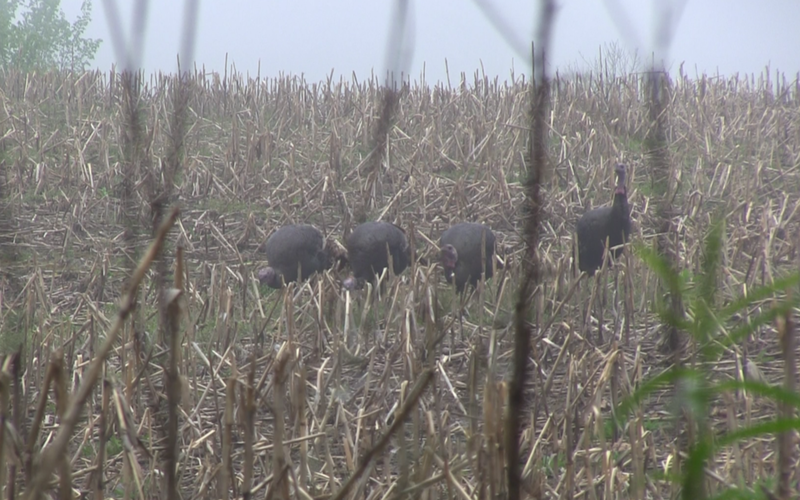 By mid-afternoon the rain had stopped and a thick fog blanketed the fields, perfect for sneaking up on turkeys. Steve escorted us to a new series of hilly fields that hadn’t really been hunted that year. 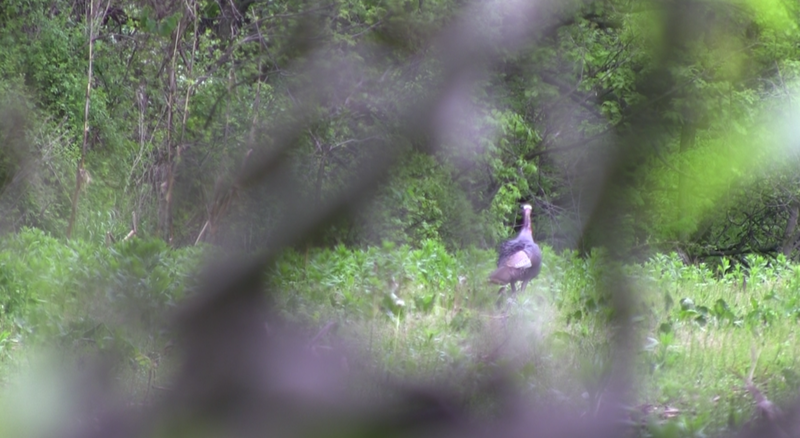 The valleys are prime for hiding for us but the hills makes us easy for turkeys to see. We hadn’t even crested the first hill when we were immediately spotted by a jake that took off into the forest, clucking as it ran. At the crest we were busted by a whitetail who snorted at us repeatedly from the thick brush. The next hill was a jackpot, a big tom off in the distance; his puffed up shape an outline in the fog. We back-tracked, keeping low and moved swiftly into the next valley to set up. I set my gun at the ready (safety on of course) and waited as Al called. We sat for about 45mins calling on occasion and nothing. We knew the tom wasn’t too far but he obviously wasn’t too sweet on us so I snuck out of my spot and moved up to the field edge to check if he had moved off. His silhouette was still there but he had been joined by 2 hens. I scanned the rest of the field and spotted a new target, another group of birds, all jakes and they were slowly coming our way. I snuck back down to our hideaway and let Al know they were coming in from our right. It was no more than 10minutes later that the first of the trio came into our view. Sauntering along slowly they spent more time with their heads down feeding then looking at our decoy. There were 4 and they moved in a slow lazy arc around us, staying well beyond the range of my 20 gauge. Finally after what felt like an eternity they started to approach us and our hen. Closer to us and closer to each other, the pack of 4 very quickly became one large bird. Al’s tag was already gone and since you can’t shoot more than one a day, I was forced to wait until they separated. The pack moved closer, circling in from my left now as a single unit. When they finally separated, they were feeding just out of my view to the left, blocked by a tangle of undergrowth. I took the safety off, waiting for the head of the first bird to come into view. But they just kept heading left out of range and out of the field. Another newbie mistake, in our earlier excitement of the Tom close by I didn’t take the time to clear the left side of my firing range and I lost my opportunity. I did move up to clear the growth but nothing else came in and we left the field empty-handed. Monday morning at 4:30am we were on the road and off to the closest Tim Horton’s for a little breakfast in the truck. We were headed out with our hosts to a fresh new area that was a wintering yard for turkeys and it hadn’t been hunted this year. The expectation for the area was high; this area was normally flush with birds so as usual we were settled in just in time to hear the chorus of gobblers. Only this morning the chorus was more akin to a solo monologue by a single loud Tom. Old and guttural, his solo gobble dominated the forest. Al and I had set up with the break in the forest on the left side of us and listened as that big boy got closer and closer. We waited, staying motionless (or as motionless as one can be while being eaten alive by mosquitoes) as the gobbles slowly got louder and louder, then stopped. Silence mixed with the buzzing of mosquitoes and then a sound broke through ‘CLUCK CLUCK CLUCK”. Busted by a hen 10ft to Al’s left. Bad news got worse when we realized that our tom was after her and not us. 10minutes later the happy couple strolled onto the field 60ft in front of us and feed happily in a large arc around us. Silence and mosquitoes quickly resumed their onslaught. The only sound of turkey was coming from us, a lonely hen call into the quiet morning. 30mins later and a gobble answered us, somewhere behind us and barely audible. Our courtship began in a slow and agonizing series of calls until we knew the gobbler was coming for us, even if he was taking his sweet time. After what felt like an hour (and was probably pretty close), the gobbles came within heart pounding range – that sweet spot where each gobble sets your heart ablaze and your adrenaline rushing. We could hear him moving through the bush at a steady slow rumble, the gobbles so loud they competed only with the sound of my pulse thudding in my ears. Each step and drag of his wings could be heard and the booming of his gobble really earned him the term “Thunder-Chicken”. This was my moment and it was the most ferocious and clear gobbles we had heard to date. He was moving slow through the brush, clearly trying to impress his lady. It took him 8 long minutes to appear at the edge of the field. Puffed to the max and strutting he let out a final gobble at the fields edge, I was so ready and I needed him just another few feet into the field. He took one look at our decoy and deflated, another bird walked away. That stubborn Thunder-Chicken refused to be called in. He did continue to puff and gobble on occasion as he walked off but was making his way slowly out of our field and into the next. He never did circle round so after confirmation with Steve and Jacquie we pulled out and met at the truck. We drove the roads looking for birds in hopes we could set up in another field but our searches turned up only hens. Steve and Jacquie knew of a hidden field (not accessible from the road) so we parked the truck and set off, 2 hunting shooting with guns and 2 with cameras. A walk and call adventure was a needed welcome to clear my head of the thunder and focus on a new bird to come. We walked through a beautiful forest, high up on ridges overlooking golden fields, just visible through the budding trees. Steve’s call echoed all around us but no one called back. We hopped a small stream and made our way slowly up a steep hill to the hidden field. Steve was in the lead and slowly lead us all the crest of the hill and the outer limits of a large and convoluted corn field. Our hen calls went unanswered but all four of us scanned the field in anticipation. Finally, we saw what we were looking for, 2 toms at the very tip of the field, making their way in. Steve whispered for us all to hit the deck and stay out of the sun. We didn’t have much for cover but the shade would be enough to hide our outlines if we didn’t move. Steve and I crawled around a large tree; each one of us crouched on our own side as Steve instructed me to wait until the count and to take the bird of the right. It would be a quick shot situation and if they birds started to act odd just get up and shoot. We waited as the 2 toms came running in, looking for the hen that wasn’t there (we had no time to set one out). The arced right and kept on moving it was now or never before they were gone. I immediately popped up, gun up and was not even remotely on target. I relaxed and re-aimed and took my shot. Annnd completely missed. I reloaded as I stood to take another shot and stood directly into a tree, I couldn’t get the barrel up high enough to take another shot and my bird was already flying. I shook off my disappointment and looked for Steve’s bird, I had forgotten to signal Steve but he had moved simultaneously to me and taken his shot. He reloaded and took another shot but had missed both times. Steve had never missed a turkey before! I must be good luck!! We tried a few more spots but went home empty handed that morning. · Picking my Own Spot – This year as the serious newbie on the team, I let everyone pick the spot but next year as the shooter I’m going to pick my spot to sit down and settle in. This is especially important since I am of very different dimensions from my fellow hunters, though maybe this would’ve been less true if Jacquie and I had gone together. This year I sat down and did a check down my barrel at the decoy but that method failed me more than one. Now, I’ll have a much better idea of what to look for in a good spot for me and even if my partner picks our overall field location I can choose what tree to lean on or what bush to hide behind. · Patterning at a Farther Distance – My choice is shotgun was perfect for me to feel comfortable in the field and would have worked out if the birds came right into our decoys but since many of our birds were being shy, I felt lacking in range. This year patterned well to 30ft but at >40ft I lost confidence in my spread. I’d like to work up to a 12guage and/or a turkey shot so I feel more comfortable at a farther distance. · Expecting them on the Run - My one and only shot was a quick shot situation and I had zero confidence in myself. I just didn’t expect to be popping out from a bush and shooting at a running Turkey. Turkeys can motor, making them difficult to aim at, especially when they’re running for a sound and there is no decoy to stop them in place. I’ll be hitting the pit for more clay practice, which is also crucial in anticipation of duck season. Watch out Gobblers, this newbie has your name on her list. We want to say a HUGE Thank You to Steve and Jacquie Shore who welcomed us into their home and showed us their turkey spots. They had patience with us, teaching us each step of the way and were wonderful hosts (despite Steve’s continuous warning that they were bad hosts). It may not have worked out for me but every day we were out we saw or heard turkeys and I have no doubt that we’ll have the same amazing experience next year. Please check out their show Hitmen Canada’s Brotherhood of the Hunt produced and hosted by Steve and Jacquie and features hunters from across Canada in their pursuit of big game animals. You can watch new episodes on Wild TV and keep up to date on their YouTube and Facebook account.